In his annual letter to shareholders, distributed last week, JPMorgan Chase CEO Jamie Dimon took aim at socialism, warning it would be "a disaster for our country, because it produces "stagnation, corruption and often worse." If this isn't socialism, what is it? Yet it's a particular form of socialism. Millions of homeowners who owed more on their homes than the homes became worth didn't get bailed out. Millions of workers who lost their jobs or their savings, or both, didn't get bailed out. No major banker went to jail. It's a gift that keeps giving. 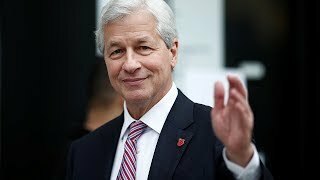 Dimon took advantage of the financial crisis to acquire Bear Stearns and Washington Mutual, vastly enlarging JPMorgan. America's five biggest banks, including Dimon's, now control 46% of all deposits, up from 12% in the early 1990s. And because they're so big, Dimon's and other big Wall Street banks are now considered "too big to fail." This translates into a hidden subsidy of some $83bn a year, because creditors who face less risk accept lower interest on deposits and loans. When Obama's regulators wanted to extend Dodd-Frank to the foreign branches and subsidiaries of Wall Street banks, Dimon warned it would harm Wall Street's competitiveness. This was the same Jamie Dimon who chose London as the place to make highly risky derivatives trades that lost the firm some $6bnin 2012 -- proof that unless the overseas operations of Wall Street banks are covered by US regulations, giant banks like his will move more of their betting abroad, hiding their wildly-risky bets overseas so U.S. regulators can't see them. More recently, Trump's bank regulators have heeded Dimon, and rolled back Dodd-Frank. Dimon was also instrumental in getting the big Trump tax cuts through Congress. They saved JPMorgan and the other big banks $21bn last year alone. Ironically, a few weeks ago Dimon warned that income inequality is dividing America. He said that a "big chunk" of Americans have been left behind, and, announcing a $350m program to train workers for the jobs of the future, lamented that 40% of Americans make less than $15 an hour. True, but $350m over five years isn't even a drop in the ocean for the Americans left behind. Wall Street bonuses totaled $27.5bn last year, which is more three times the combined annual earnings of all American workers employed full-time at the federal minimum wage. That's more than 600,000 low-wage workers. If Dimon were serious about the problem of widening inequality, he'd use his lobbying prowess to help raise the federal minimum wage. He'd also try to make it easier for workers to unionize, and to raise taxes on the super-wealthy like himself. Dimon's real concern is that America may end the kind of socialism he and other denizens of the Street depend on bailouts, regulatory loopholes, and tax breaks. These have made Dimon and his comrades a fortune, but they've brought the rest of America stagnation, corruption, and often worse. Another great article. Dem pols don't get it. Trump won the election exactly because of what you described. I like the majority of Americans voted Clinton. But the surge of pissed off people voting Trump was simply unbelievable. He can't win agian. The Obama/Trump voters wont do it agian If he does win again it most certainly will be rigged again. Meanwhile to make that impossible democrats MUST promote what people need. Health care. Good jobs or generous subsidies. Climate action. And to pay for it halve mitary spending tax Wall street , mandate a functional financial/ monetary sysstem. Until people start tossing BOTH dominant parties under the bus, don't expect change any time soon. Even then, the corporate capture you're under might still keep doing damage.